WonderMedia Technologies, a subsidiary of Via Technologies, has recently announced the WonderMedia PRIZM WM8950, a dual core Cortex A9 processor running up to 1.2 Ghz with a Mali-400MP2 GPU. This new SoC supports Android 4.2 Jelly Bean, Linux, and WinCE 7, and targets applications for mobile, digital home and business applications in devices such as tablets, smart TVs, networked projectors, digital signage players, and thin clients. It also features integration of the Wi-Fi CERTIFIED Miracast standard into the WonderMedia SmartStream for support of DMR (Digital Media Renderer) and wireless display functionalities over standard compliant and legacy WiFi direct and WiFi devices in both embedded and Android environments. 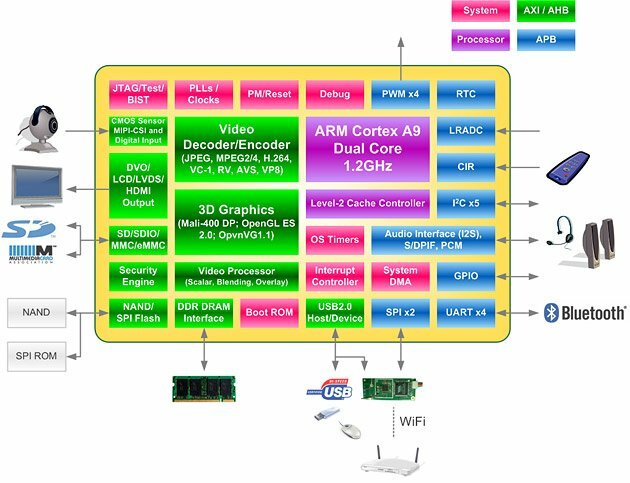 WM8980 supports HDMI, LVDS, and DVO video interfaces, features a CMOS sensor input for webcams, SD / SDIO / MMC / e-MMC interfaces, USB 2.0 Host/device, audio interfaces (I2S, S/PDIF, PCM), SPI, I2C, UARTs and GPIO. Wi-Fi and Bluetooth can be supported with external chips via SPI and UART interfaces. The peripherals are very similar to the earlier Wondermedia WM8950 cortex A9 SoC, except Ethernet has been dropped. WonderMedia does not provide details about their SDK and/or reference designs publicly, so you have to contact them for details. 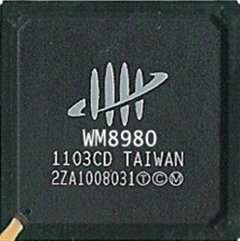 The kernel and u-boot source code WM8950 is available in github (for VIA Paper PC and Rock board), but I’m not sure to what extend it could be used with WM8980. WonderMedia PRIZM WM8980 samples are available now and mass production is expected to start in Q1 2013. Further information can be found on the Prizm WM8980 product page. Via Gabe and PC Perspective.